This first semester of Thesis, I began digging into references for art and storytelling being basically inseparable, and rooted deeply in the recollection and expression of experiences that tie us to each other. In essence art is an effort to mark our existence and share our common anchors. Perhaps the people who began painting in the caves of Lascaux were just beginning to be aware of common experiences and noted them on the walls for others to recognize. My last art history paper delves in more deeply, but for now I will share three of the more successful pieces of work. Existential Loneliness is the inner sense of loneliness or emptiness that cannot be filled or eased by human connections. Often, the feeling can actually be accentuated by large groups of people. This work began based off of sonar and deep sea scans, inspired by the legend of The Loneliest Whale. It’s worth a read. The sweep of worldwide empathy for this odd whale gives hope to the odd ones among us, that there’s a place for us. These forms reminded members of my cohort of radar and the blips of large objects on the screen. This paralleled the idea of sonar- the reach into the void for contact and connection. Most times, road trips, time alone, and space to dig deep with friends assuages some of my own sense of loneliness. Watching radar and experiencing the smallness of my self on the land while driving is one of the most fulfilling things I have done that brings me peace and contentment in front of the massiveness of the universe. Summer/Fall 2016- electric to wood kiln conversion! Electric kiln to wood conversion. The purpose of doing this project was to have a wood firing option for Hesston College, and also to show my students that you CAN have a functional kiln on a small budget. Total cost: electric kiln shell: $200, 36 soft bricks: $180, EPk and sawdust mixture: approximately $5, 20lb propane tank fill: $25= $410. In it, he describes how and where to cut the burner port and stoke hole, and how to stack the shelves and construct the chimney. Double brick floor, half brick inner shell, both for insulation and to make a replaceable layer to prolong the life of the kiln. Packing the element grooves with EPK and sawdust. Building the inner shell. Inner shell moving along, coated with high Alumina kiln wash. Burner port. Stoke hole with burner lit. Lit with propane to red heat. Started at 1lb, slowly up to 4lbs, then switched to mostly wood with 1lb propane to maintatin baseline. Beginning reduction, constant stoking with wood and 1.5lb propane. Shut down, closed up, peaked at 2327. (Turned out shelves got knocked sideways from stoking and hindered circulation, stalling the climb.) Results were successful, and educational. Flashing slips did not get enough ash, but Shino glazes turned out beautiful. Ash blushes were present, time just did not allow for build up. Will try soda ash soaked wood next time, as well as different glazes. Cone 10 down! Final temperature very satisfactory, regardless of the low temperature peak and shelf shift. Second full brick thickness in the floor for insulation purposes. Half brick thickness inner shell for extra insulation and to give a “disposable” layer to extend the life of the kiln overall. Packing element groves with EPK and sawdust. Element grooves packed, measuring and cutting inner shell to help extend the kiln life.. Inside, elements packed with EPK/sawdust, inner shell in progress. Coated with a high alumina kiln wash.
Propane on! Stoke hole view. Slow climb to red heat- started at 1lb of propane, slowly up to 4, then cut back to 1 as soon as we started adding wood. Reduction- constant feeding of wood, gas at about 1.5lb. The most recent project for this summer’s class was a filled space, not site specific, Simulacra or Enchantment installation. I worked with the Simulacra idea, a different space within our normal environment. An Enchantment involves changing your normal environment to present an idea. In any case, though, these pieces differ from the Castle Rock day, in that they can be picked up and moved to any place and remain the same. They are not dependent upon their location to be effective. I used the Crucibles again, they are proving quite versatile, and I love getting to know each of them better as the weeks go on. Each of them has dimples and curves that are different from the others. In order to lend context to the idea of Crucible- a ceramic or metal container in which metals or other materials may be melted- a place or situation in which elements interact to produce something new- I used text on a canvas drop cloth to portray the above paraphrase from Merriam-Webster. While the end results seem somewhat PotteryBarn-ish, I learned a ton about display elements, how to welcome an audience to experience your work in a non-traditional way, the pitfalls of psychological boundaries (the edge of fabric is an effective wall to interaction), and how to make intent clear without being blatant. Clean and clear tagging is important. Next week is a Personal installation in which I will work on a small version of my current thesis proposal. Keep your eyes peeled! This summer’s class is an installation and exhibit planning course, giving us exposure to and practice with a number of different types of installation work. Our first major assignment was to work with the landscape at Castle Rock, KS, to create a Rapprochement installation, or a work which is in harmony with its surroundings. The flip side of this assignment is an Intervention, in which the audience is encouraged or forced to engage in the piece and gain and experience, whether difficult or unpleasant, or simply thought-provoking and tricky to navigate. I was unsure what to expect, but I love the idea of being in harmony with the space you are in. To prepare for the project, I made notes of what I was looking for: an incline with ledges, possibly some foliage, hopefully water-washed, and shaded. Upon arrival, a perfect spot showed itself in short order and I set about setting up the Crucibles from last semester. This combination of high fired and glazed stoneware against the chalky stone of the Castle Rock formations worked better than I had imagined and I went back with my friend and colleague, Eleanor Heimbaugh, to try a few new settings the following weekend. Previously, we had been assigned a practice round, for which I made several small cups, and installed them on the Hays Hanging Bridge. I didn’t connect the dots about the Hanging Bridge, but from what I understand the bridge was used for lynchings. Upon learning this, I went back and added some iron oxide to water in the cups and photographed them as they began to disintegrate. This piece was deemed still object based, as you can see the entirety of it from one viewpoint, and was great practice for the Castle Rock project. From the earliest beginnings of art, before the ideas of ‘concept’ and ‘intention’, mankind has made efforts to narrate and value the human experience. From the earliest cave paintings, as best we can surmise, artists, as we have come to call them, have documented and named our activities from the mundane to the profound, using whatever was at hand to do so. As early as 400,000 BCE, humans began depicting themselves, consciously recognizing our image and existence in small stone sculptures. The purpose of these small figures is lost to time, but many theories abound, from playthings for children to fertility rituals and worship. As skills developed, new details and investment in form occurred, and the aesthetic sophistication of each piece notes a step forward in humanity’s search to document and express the significance of their lives. This advancement is easily seen when comparing the Woman from Willendorf, a well-known limestone figure, to the aforementioned stone effigies. These steps leap forward with the discovery of clay and its ability to be formed and made permanent in fire. While Europe has no broadly documented history with clay until approximately 8,000 BCE, these figurines do occasionally show up, dating back to 26,000 BCE, as this figure from the Czech Republic indicates. As has been noted by many historians, the paintings in the caves at Lascaux could be interpreted as narratives for the daily lives of the hunters and gatherers who populated the area at the time. Beginning about 4,000 BCE, early ceramics began to bridge the gap between representation and function, paving the way for more modern European ceramics. Over time, as function became more important, form also became more intricate, and the more intricate it became, the more valued it was, as its fragility dictated a more sedentary lifestyle, and often that sedentary lifestyle came as a result of personal wealth. Here, we make a leap to the 1500s the work of the Palissy school. The advent of porcelain, and Bernard Palissy’s efforts toward replicating the purity and color of said materials, as well as his regard for the natural world, creates a window into a section of the culture at the time. With royal patronage, the Palissy school created a wide range of semi-functional to decorative works, representing the natural world and humanity’s connection to it. As with Palissy’s obession with porcelain and his fortunate royal patronage (until his death in prison for expressing errant religious views), so was Sevres porcelain work of the 17- and 1800s, championed by the aristocracy. With the patronage of King Louis XV, French Sevres ware became an indicator of wealth and culture. Figurines were again in fashion, though instead of depicting or revering the figure in a ritual sense, the Sevres forms depicted narratives from popular performances, indirectly giving voice to the culture of the time. The Sevres work was primarily a commodity of the wealthy, and the factories struggled to remain solvent, while still producing intricate and functional work. Under Napoleon’s reign, and under the new direction of Alexandre Brongniart, Sevres production became more available to a broader audience. Now, how one might relate the delicacy and grand flourishes of the Sevres-type ware to the earliest figurative pieces like those from the Czech Republic may seem like a stretch. However, if each of these expressions is taken as a representation of what is of value to each of these cultures, the connections make sense. We create and revere what identifies us, whether it be a small ritual figurine, or a gilded vase. These things mark each of us, whether maker or owner, as a part of that piece of history, filed in time against what is important to us as a culture. This holds true moving forward into more modern times. Relics of the naturalism of Palissy and the grandiose delicacy of the Sevres eras show up again and again in contemporary ceramic art. While we can look back and see these connections as intentional on the part of the artist in many ways, how will this be interpreted in future centuries? When these documented connections are lost, the roots are still there, winding through history and tying this whole grand timeline together. May we all bear our connections to the past, and our efforts to document and narrate what is important to us, and therefor bookmark our place in history, with such attention and passion as those who came before. Upon first blush, these materials interacted surprisingly well with my current clay body. Obviously, some in their solo state will not be so great, but it didn’t take much of an additional ingredient to make them adhere. Most notably, EPK solo was almost adhered, but with 25% whiting did not adhere at all. 50/50 EPK and Whiting, the middle bottom, adhered somewhat, and was a delightful crispy, hard surface. Whiting by itself peeled off, but with 25% EPK formed a slightly crusty surface, alluding to a fake ash, but a step or two too dry. Along the left side, EPK with 25% Custer crazed heavily and did adhered only marginally better than the EPK with 25% Whiting, but was a more interesting surface, with smaller crazing patterns than the Whiting combo. Middle left, 50/50 EPK and Custer, is a quite dry matte with very small crazing patterns and hard and satisfying feel. Custer solo is a very glassy and white surface where it pooled and added a gentle sheen to the bare clay, but crackled when thick in the inside. 75% Custer and 25% EPK is a buttery, hard grayish white that may warrant further exploration. Along the right side, 75% Whiting with 25% Custer also echoes a fake ash, but appears to want to crystallize and begin to bubble where it thickens. Its base is grayish and thickens through gold to a glossy brown at its thickest. 50/50 Whiting and Custer a slightly more matte version of 75/25. As noted above, 100% Custer is very glassy. 75% Custer with 25% Whiting is a glassy grayish that brings out the iron speckles in the clay really nicely. A good fit for this clay body, and allows the color and texture to come through. In the interior triangle, top, 50% Custer/25%EPK/25% Whiting, is probably the most exciting result for me. It has an eggshell matte finish, brings out the iron of the clay, and is smooth to the touch. Left bottom of the interior triangle, 50%EPK/25%Custer/25%Whiting, is the second most exciting. It is a tad crusty to the touch, but brings out the iron in the clay AND gets an orange halo at the thin edges. Right bottom has potential as well, but doesn’t grab me quite as much as the others. It is a 50% Whiting/25% Custer/25% EPK combo, and is the closest of these to a fake ash. Its base is a grayish white that goes through yellow to greenish where it is thickest. It does not appear to run excessively, which is a plus. Overall, this combination of materials has great potential, and the inner triangle may warrant further, more incremental exploration, as well as colorant testing. As part of our Materials and Processes sections, we were charged with exploring Maijolica techniques and slabbing. My slab box turned out pretty well, finished with Evolutionary Scrap glaze. The Maijolica experiment didn’t go quite as well. I got a little to excited with painterly brush strokes and line making and forgot to do outlines and fill in the shapes. So any shapes that I put on top of the color fields got eaten up by the copper underlay. So, there will be further experimentation in the future, and I will keep my color swatches under control. 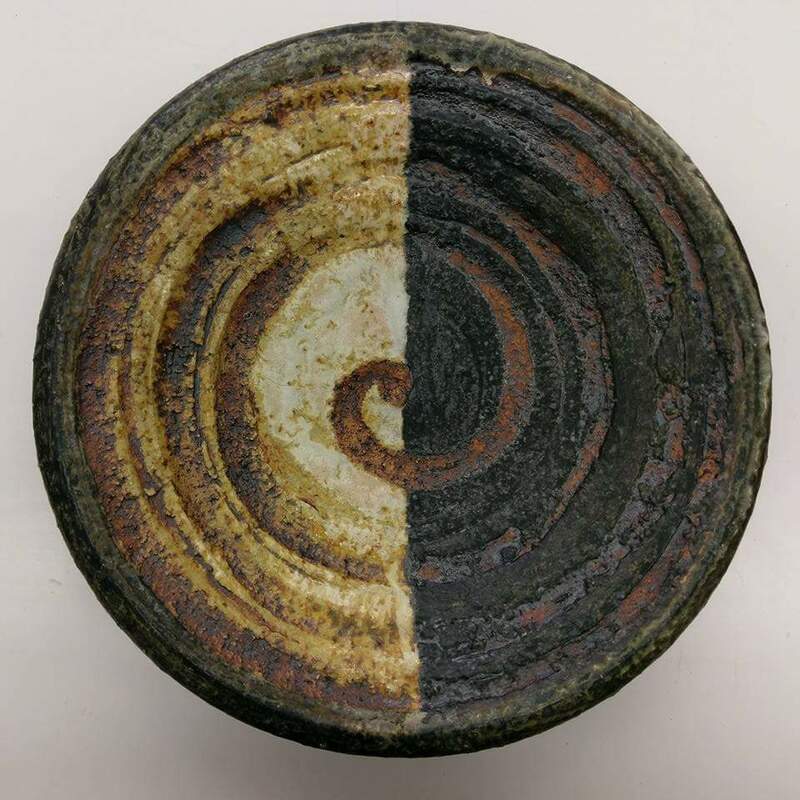 These bowls are about 6 inches across, press-molded out of red earthenware with sand. These larger bowls worked better, though the blue still ate the linework. 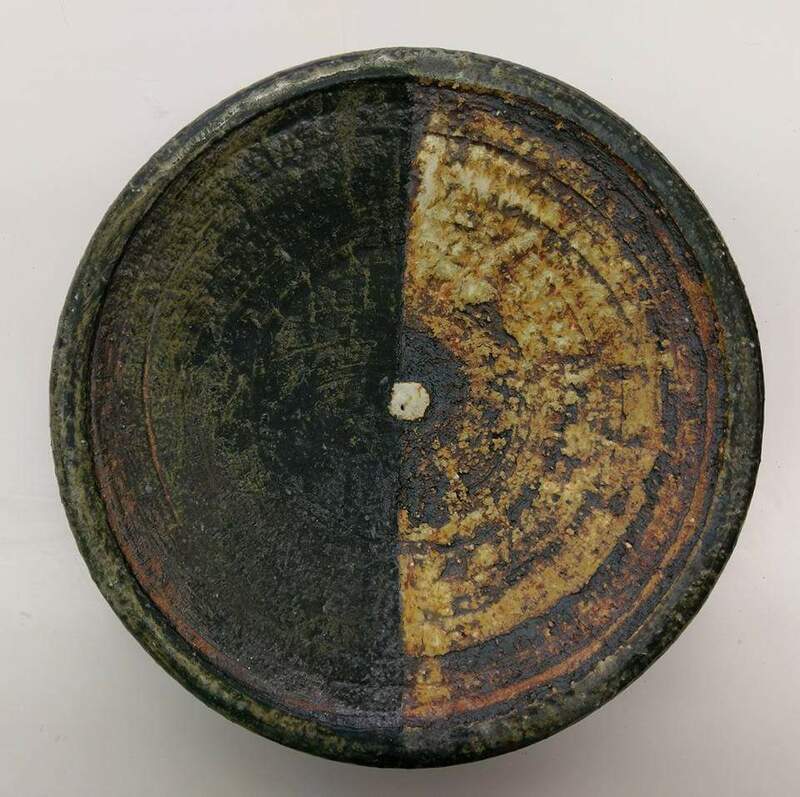 These bowls are about 15 inches across and 5 inches deep. Wheel thrown red earthenware with sand, grog, and perlite. Spring Semester 2016 is the first semester since the grand platter discovery. I am still working with that format, incorporating drawings into decals and firing. This first series is not yet complete, but will be in a couple of weeks. There are seven platters in this series, titled Revelation. This started out 45 lbs of fat groggy stoneware with perlite, after throwing and trimming, it is now approximately 40 lbs, drying slowly. 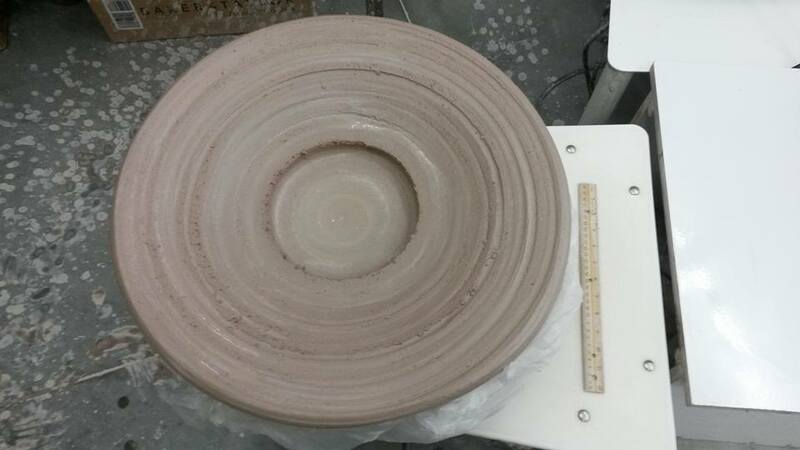 21 inch diameter, 5 inch height. Will eventually be finished with Rusty Matte Blue glaze and have a single image applied in the center. Finished pics of everything to come! After several sketches and a bit of floundering, and then heavy despair, just after midterms… This happened. 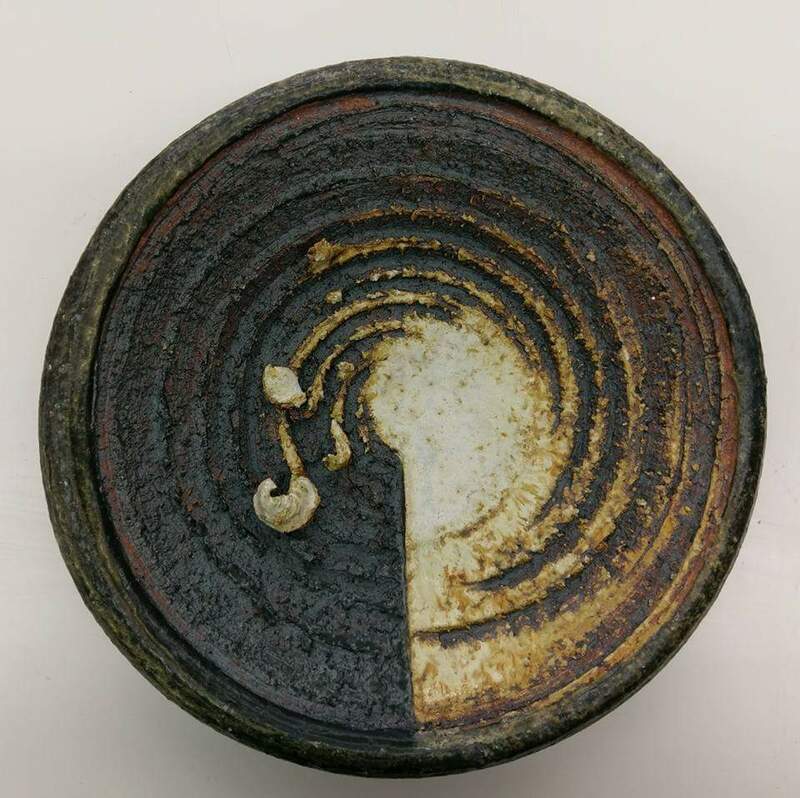 We had just started throwing in my beginning ceramics classes at Hesston College, and all the varying degrees of success with beginning throwers were in full steam. Everybody was doing great work, getting thrown around by one pound of clay, or getting back in practice with 2 or 3. In a moment of curiosity and remembering a vow I made to myself several years ago, “if it’s new, or isn’t easy, or if it’s scary, definitely do it at least once”, I hauled out 25 pounds of Conrad Snider sculpture clay, plopped it down on a wheel, and went to work. I was sweaty and exhausted by the end, and got well flung around in the process, standing with one knee on the wheel and the wheel braced against my other leg. I am sure it was entertaining for those still present from class. In any case, this experience changed everything. All I can think about is platters. I wake up thinking about that hard, heavy work, and the textures and forms that are possible. There is not enough time in the world. So, the third personal series for this semester is an image based story on platters, with decals made from my own drawings, titled The Seven Stages of a Fight. The image aesthetic is based upon Depression Era wordless novels and protest literature, drawn from Wordless Books by David A Berona. Shouting. Anger. Chagrin. Acceptance. Isolation. Apology. Resolution. For the second series of work this semester, I chose to return to coil building and figurative forms for a moment, regrouping, in a way, from a very difficult initial portion of the semester. These four pieces, based upon profoundly transformative travel experiences that I knew were shaping who I am as they were happening, were meant to unite varying degrees of abstraction with carved imagery in the graphic-novel-esque style I have been working with for some time. Just as the stories associated with these pieces transformed me, these pieces began the transformation of this semester from being a wrestling match into a huge open door. Success! They are made of stoneware clay and finished with Rusty Matte Blue, Green, Yellow, and Brown glaze, and Iron Oxide. Bases are oiled Walnut. Canoeing in Alaska- I think I was twelve years old, maybe 11, and I remember all of us paddling through the fjords south of Juneau, and realizing how powerfully strong I felt, but also how tiny we were, above such very deep water, and knowing there were likely much larger creatures somewhere below us. I based the images on this piece off of Inuit bone carvings. Subway Navigation in Paris- While I was a Senior in college, I was part of a study abroad program where we traveled to French cultures on this continent, as well spending six weeks in France. There were substantially more women on this trip than there were men, and because I was able to read maps, I was selected to lead my group around Paris. This meant making sure were all stayed together and didn’t get lost, but also were able to make it to and from various assigned locations on a schedule. This was my first true experience with leadership, was reasonably successful as I recall, and I came back home with a level of confidence and self-trust that I had not experienced to that point in my life. Engagement in Sweden- There once was a wonderful young man who I traveled to Sweden with, to visit his childhood stomping grounds. We waded in the sea and caught small fish in our hands, drove through misty woods listening to music that gave us shivers, and saw windmills on rock outcroppings off the shore. While we were there, we exchanged rings on top of a stone mountain, and began to plan a future. While this didn’t work out in the end, we had a wonderful time, and it was the beginning of a series of events where I learned the value of deep honesty. Sitting on a Sunny Rock After Driving Two Full Days Alone in Yosemite- My best friend from college passed away a few years ago. Several of us from college met to say goodbye to her and build new memories in her favorite places in Yosemite National Park. I drove close to 18 hours the first day, then about 9 the next, and at one point looked up at my rear-view mirror and saw that the road was stretching straight as far as I could see in front of me, and as far as I could see behind me, as well. I have never felt so full and so alone at the same time, and I was screaming at Kate “OH MY GOD HAVE YOU EVER SEEN SUCH AMAZING THINGS!! !” and felt her there laughing with me. I arrived exhausted and cleared, and the next morning, chilly and dewy, sat on a sunny rock in my favorite hoodie, and felt things settle into peace.